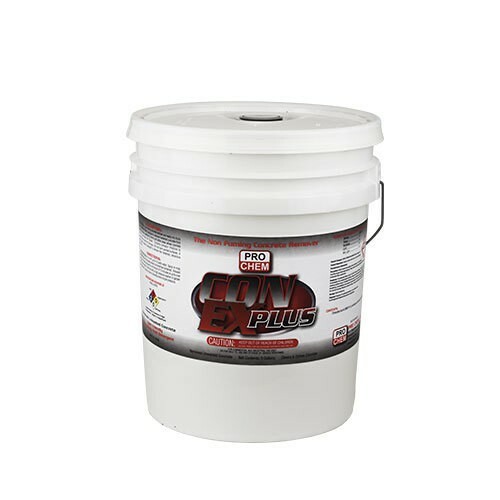 Con Ex Plus | Pro Chem, Inc.
CON EX PLUS is a nonfuming concrete remover and ready-mix truck wash. It is designed to remove hardened concrete from ready-mix trucks, scaffolding, forms and other areas where concrete tends to accumulate and harden. Contains corrosion inhibitors to protect ferrous metal from damage. Will not harm painted surfaces. Use CON EX PLUS as is or with up to 12 parts water. Spray or mop CON EX PLUS into areas where concrete has hardened. Allow to remain on these surfaces for a minimum of 10 minutes or up to overnight for best results. Remove with a high-pressure washer or garden hose with a spray nozzle.